« Sunspots high – sell or buy? The stock market has produced a nice swing to the upside in our current lunar green period. But that green period is about to end later this week, so we could be seeing the end of the rally in the coming days. The S&P 500 has risen by 200 points since last November, and as you can see on this chart, the move is nicely contained within a narrow channel. But this rate of change can normally not be sustained for a long time, it would take the S&P to 2000 by the end of this year. 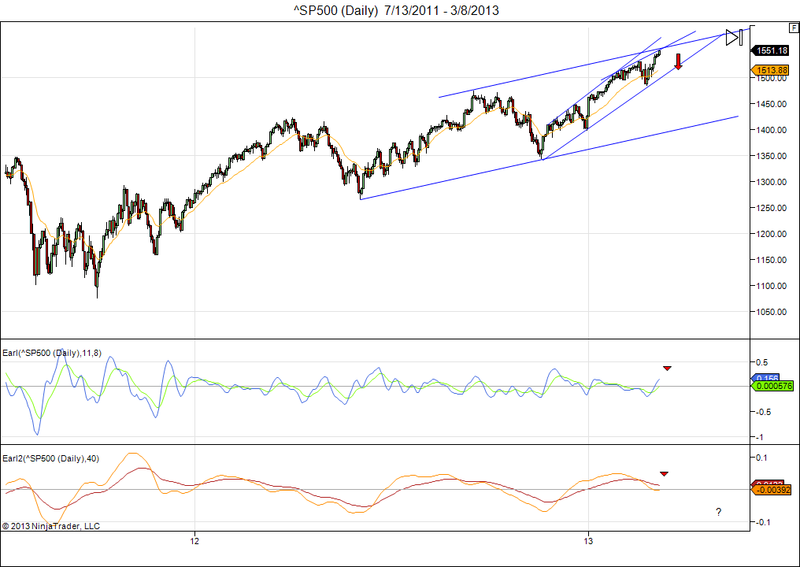 So, we are very likely to see the market fall out of this steep channel within the coming months. And when it does so the decline will be of a bigger magnitude than the brief pullbacks we got in late December and February. Our Earl2 indicator has been signalling an impending top for a while and continues to do so. Meanwhile the shorter term Earl is now also in position to create a top and turn down. Any drop below 1510 would now signal the probable end of this 4 month rally. This means I am doing some serious reductions in my stock portfolio this week (I already sold some last week). In the best case we will be going sideways for some time, but my guess is we will see the S&P at 1450 before we see 1600. And if I am wrong, then I can always re-enter the market on a break above 1600. This entry was posted on March 11, 2013 at 12:04 pm	and is filed under Financial Astrology, Market Commentary. You can follow any responses to this entry through the RSS 2.0 feed. You can leave a response, or trackback from your own site. “So, we are very likely to see the market fall out of this steep channel within the coming months. If I were expecting a rise to 2000 this year, then I wouldn’t be selling.. They have been around for some time. But maybe one should wonder why it is so hard to find their previous years predictions on the site.